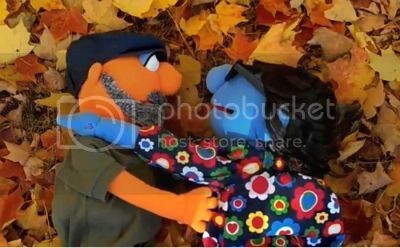 Listen, internets, you’ve got a lot of nerve making me all unexpectedly verklempt when I’m just looking for some hilarious, unadulterated Muppet action. When the time came, Sid ordered custom designed Muppets that resembled the couple and produced a film about them. It was shown along with the previews at a theater he took Sara to. Of course, she recognized who the Muppets were as soon as she saw them. And she said yes! Yes, this is very sweet, even if it does look like the Sid-puppet is pleasuring himself to a video game in the beginning of the clip. Even so.